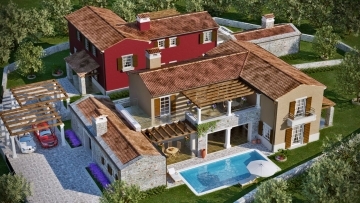 A beautiful renovated villa near Buje, 25 km from the sea. The surface of the villa is 300 m2 and of the garden 450 m2. It consists of the ground floor and the first floor; it has three bedrooms and three bathrooms, an open living space, a kitchen with a dining area, a terrace and a large pool with plenty of sunbathing area. There is also a summer kitchen with a barbecue. A great house for rental!